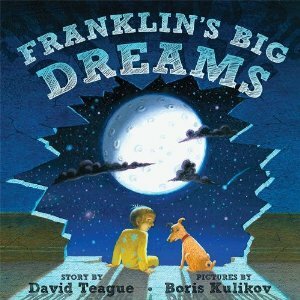 I'm shilling for a friend who has his first book release today: Franklin's Big Dreams. Yes, it is a children's book and yes, I have zero children, so what?? I'm sure many of my readers have nieces and nephews who might enjoy such a book. While the word 'friend' might be a strong one to describe the author, I have known David Teague for about 15 years now, though I can count on one hand - or maybe two - how many times I have actually been in the same room as he. That being said, we get along quite well and he's someone I genuinely like (and you know that is a rarity!). He's a great guy, a nice guy and he's an excellent cyclist (or so he claims!) - so he's got that going for him. ...plus he's got a book deal. I'm just an ok guy, and sometimes nice and I'm a very average cyclist. I have no book deal. Yet. I am a teensy bit disappointed in Mr. Teague. The plan was to put up on his site, a place for people to log their dreams. I thought it was a very cool idea. And I have some doozies, even though I'm sure it'd be a family-like site so I'd have to pick and choose my ones carefully. But I don't see where this has happened, though it could have been a nice tie-in and great reader participation. Maybe that's phase two of the promotional campaign. Some of your readers (even the gay ones)have children! Though mine have aged out of that reading bracket! Thanks for promoting books and reading. and friends.